How to: Setup Outlook 2003 - Holland Computers, Inc. The following describes what each setting means and what you should enter. Your Name: Enter your name as you want others to see it. Email Address: Your full email address (ie user@yourdomain.com). Incoming mail server: Enter mail.hollandcomputers.com. Outgoing mail server: Enter mail.hollandcomputers.com. Please Note: Some ISP's will only allow you to send outgoing mail through their SMTP server. 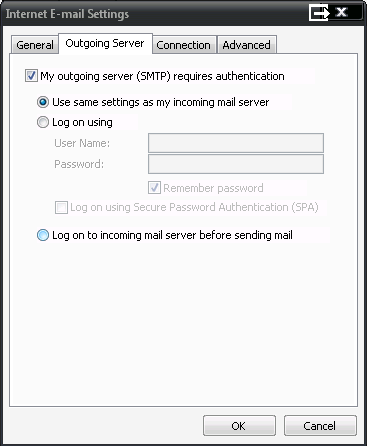 If you experience problems sending mail from Outlook 2003, you may have to change your Outgoing SMTP to their server. User Name: Your full email address (ie user@yourdomain.com). Click on More Settings then the Outgoing Server Tab. Make sure that the "My outgoing Server (SMTP) requires authentication" box is checked.